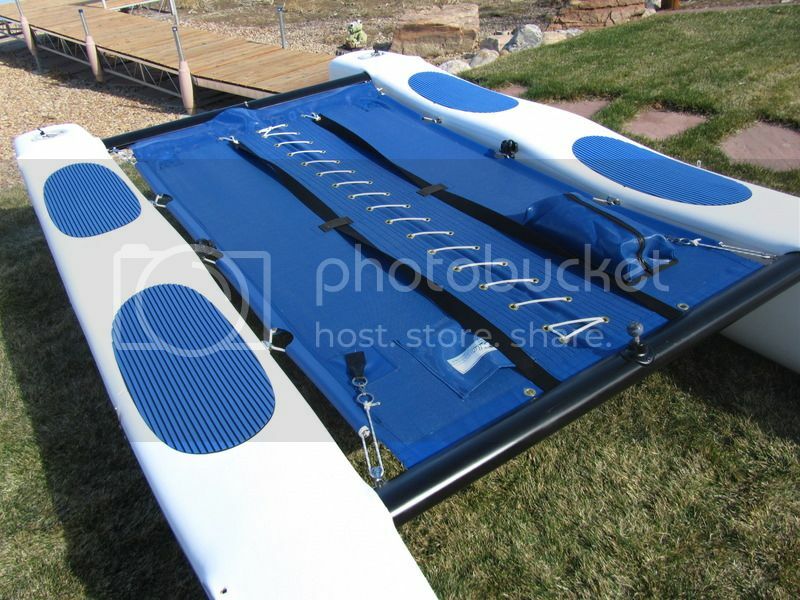 Hobie Forums • View topic - A tight trampoline on a "classic" Wave? YES! A tight trampoline on a "classic" Wave? YES! Post subject: A tight trampoline on a "classic" Wave? YES! I've seen a lot of posts from guys complaining that they can't get the trampoline on their "classic" Wave tight enough. Well, here's one solution to the problem. I just installed a new tramp I got from Slo Sail and Canvas. They have a tramp on their website for the "classic" Wave that has rear lacing. 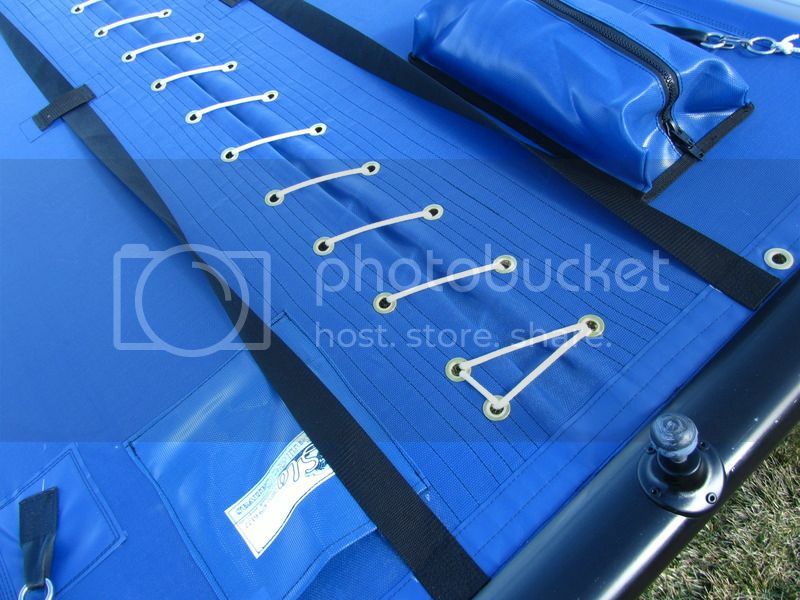 This is a good start, and it allows for the installation of a main sheet traveler as well, because it eliminates the velcro straps around the rear crossbar. I called them though to see if we could take things one step further. I asked them if they would add lacing down the middle for me. They said, "sure, no problem". Here's some pics of the finished product. 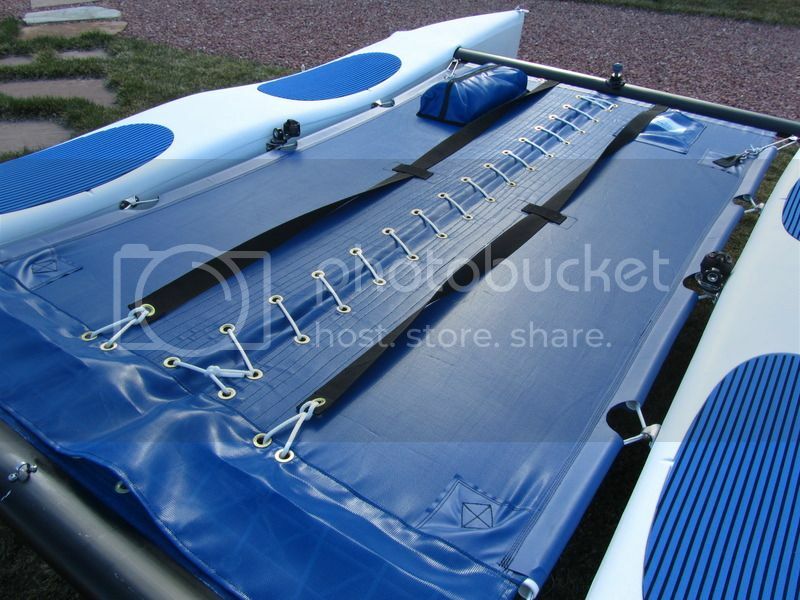 Post subject: Re: A tight trampoline on a "classic" Wave? YES! Man that looks nice, AND TIGHT !!!!!!!!!!!!!!!!!!! Way to go Dude !!!!!!!!!!!!!!!!!!!!!!!!!!!!!!!! That does look sharp. My only concern would be how much load can those stainless steel hooks for the tramp wires take? Specifically, how are the hooks fastened to the hull? Is there a threaded insert in the hull, or is it just a self-tapping screw that's screwed into the plastic? If it's a self-tapping screw, I think you just want to be careful not to rip it out of the plastic with too much tension. Otherwise, I think it looks real nice - nothing worse than a saggy tramp. Those hooks screw into a threaded aluminum insert that's embedded into the hull. It is standard pre 2001 (I think that's when they switched over to all Waves having the tracks) Hobie stock. It should be just as strong as the tracks are. This is a 1998 "classic" Wave. I think it looks good too. Thanks. Wow. Those look great. Coincidentally, I just ordered aft tramps for my Getaway yesterday. I got the same color and added the zipper pocket as well. 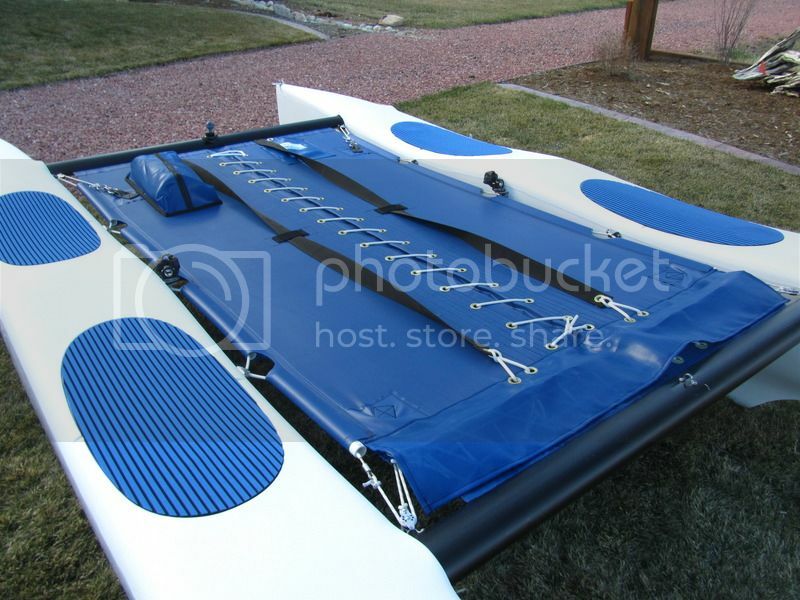 I already had an SLO forward tramp, but the mesh is so fine it acted like a sail and caught the wind when flying a hull or trying to right the boat. 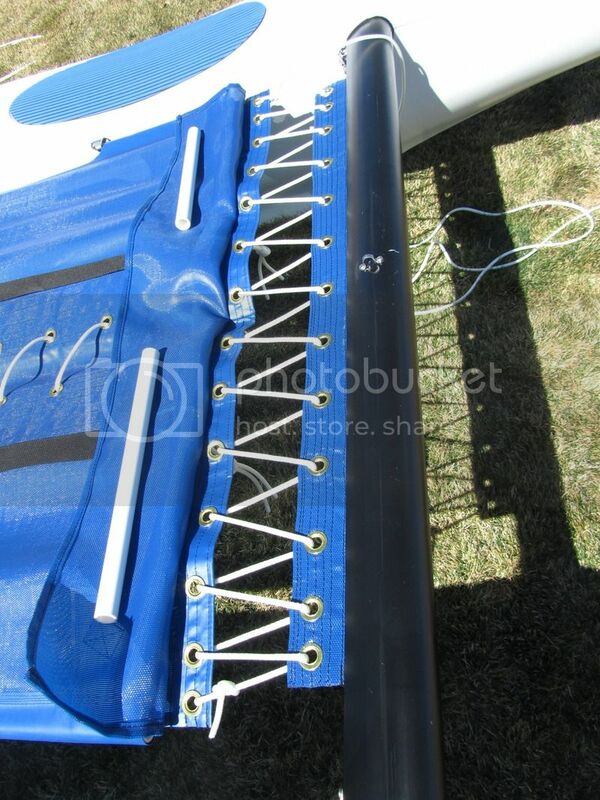 Other than Hobie, is there somewhere I could get a forward tramp with mesh similar to the stock one? Not sure who might have the same material as stock, but many companies will send you samples of the material they use. To the OP, How much extra did they charge you for the center lacing? You'll have to give them a call for pricing. I don't want to tell you something wrong. The product has been officially added to the SLOSC website for anyone that's interested. Hi, are those new seat pads from hobie? 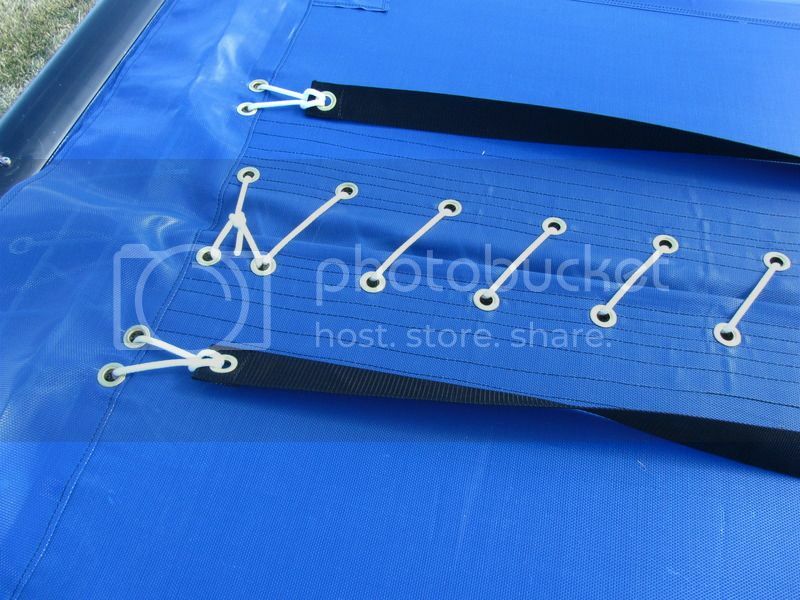 What are you using on the side that hooks into the metal hooks? It looks to be line not wire. Always have trouble getting the wire to stop fraying. I do have the cables on there, but I put a cover on the cables to help stop the fraying. I know this is an old thread, however I am wondering how that tramp has worked out over the past few years?